Werk van Ken Knowlton Polyominoes is the general name given to plane shapes made by joining squares together. Note that the squares must be 'properly' joined edge to edge so that they meet at the corners. Each type of polyomino is named according to how many squares are used to make it. So there are monominoes (1 square only), dominoes (2 squares), triominoes (3 squares), tetrominoes (4 squares), pentominoes (5 squares), hexominoes (6 squares) and so on. Though the idea of such shapes has been around in Recreational Mathematics since the beginning of the 1900's, it was not until the latter half of the century that they became as popular as they are today. In 1953 Solomon W Golomb (an American professor) first introduced their names and outlined their possibilities to mathematicians, who seized on them with considerable interest. They were not brought to the notice of the world in general until 1957 when Martin Gardner (in his famous column in the Scientific American) wrote about them, and they have remained a rich source of spatial recreation ever since. Pentominoes (made from 5 squares) are the type of polyomino most worked with. There are only 12 in the set (because shapes which are identical by rotation or reflection are not counted). This means that they are few enough to be handleable, yet quite enough to provide diversity. Click the name of the polyomino to see what they look like. Ken Knowlton mails :"Thank you for the kind words about my artwork. 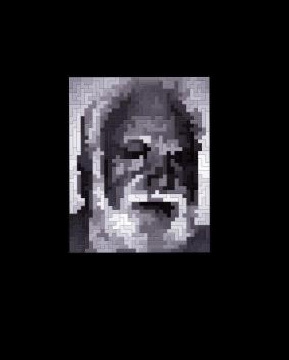 Yes, I would be pleased if you put my portrait of Solomon Golomb on your Pentomino site, and would like, as you suggest, for you to add a link to my site www.KnowltonMosaics.com"